“Double loop learning” is used to reflect on why an intervention does, or does not, achieve the planned results. This involves considering the validity of assumptions behind the development interventions and drawing lessons to improve the approach. This is necessary because bringing about social change is a complex process. We all know many illustrating examples: building a school in a remote village only helps if there are teachers willing to settle there; assisting farmers to market their crops is not a good solution if the effect is that their wives will now have to work harder in the fields. The challenge is to build learning into the work practice so the intervention approach can be adjusted in time. The motivation to learn is often a desire for personal growth. For organisations, the motive is that learning contributes to better performance and better outcomes from its interventions. Double Loop helps to design your learning process, something that will always be linked to the content of your interventions. This is illustrated in the diagram below. The organisational practice is positioned at the centre. Reflecting and interpreting on what happens in practice feeds the learning process. A good learning process will lead to improved competencies, strategies and collaboration. Double Loop advisors help you create space for learning in development programmes and peace-building activities by integrating it in daily practice. In order to structure the learning process, we use a dynamic learning agenda. Key areas for learning are linked to urgent issues and learning goals are set. Informal peer learning between practitioners will be stimulated because employees only learn 10% of what they need to know in formal courses and the remainder through experience and informal contacts. 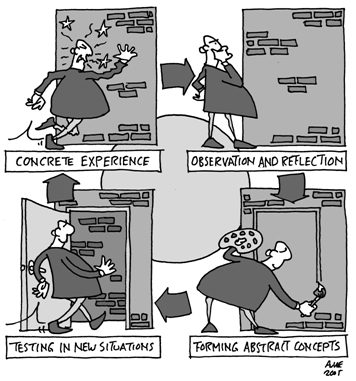 New insights will be made explicit through moments for reflection from which new learning questions will emerge. In this way, the dynamic learning agenda will be enriched and updated and your organisation will ultimately become more professional and innovative. 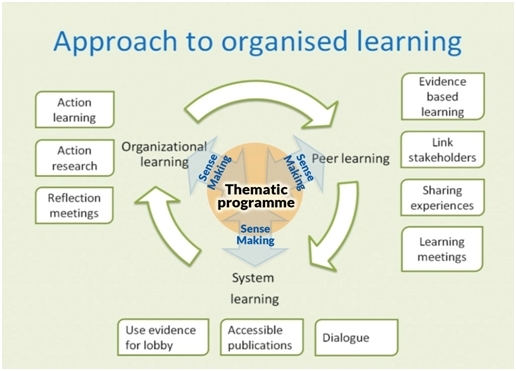 Organisational learning – The goal is to improve the organisational strategies and organisational practice. Inter-organisational learning – The goal is to achieve improved collaboration towards an increase in combined influence. System learning – The goal is a better understanding of the stakeholders, how the system functions and how changes happen. The three areas complement and reinforce each other. Emphasis can be on one realm, but it is important to be aware of existing linkages with other areas. In our services section we explain how we combine thematic support, which is related to the content of your practice, with support to the learning process. test an improved approach, which will result in new experiences. It is a cycle, so after applying new insights you reflect again on your experiences and learn from them in continuously improving cycles. By consciously going through the learning cycle you improve the quality of your learning. Action research is also a circular process, but it combines actions for improvement with research for a deeper understanding. The understanding allows more informed change and at the same time is informed by that change. People affected by the change are involved in the action research, which allows the understanding to be widely shared, and the change to be pursued with commitment. “Action learning involves working on real problems, focusing on learning and actually implementing solutions. It is a form of learning by doing”.